in their lightweight championship bout during the UFC 205 event at Madison Square Garden on November 12, 2016 in New York City. Conor McGregor defeated Eddie Alvarez in their lightweight championship bout during the UFC 205 event at Madison Square Garden on November 12, 2016 in New York City. UFC® today announced the results of an economic impact analysis following its historic UFC® 205: ALVAREZ vs. McGREGOR, which took place on Saturday, November 12 at Madison Square Garden. Results of the study concluded the landmark event made significant contributions to the city and state of New York with $37.4 million in economic output and $18.3 million in salaries and wages. The event also supported an estimated 300 jobs in the New York metropolitan area and generated $1.6 million in taxes for the state. UFC has pledged to hold at least four events per year in the state for the first three years since the passage of legislation to legalize and regulate professional mixed martial arts in the state. The global brand recently announced its fourth event in the state will be UFC® 210: CORMIER vs. JOHNSON 2 on Saturday, April 8, at the KeyBank Center in Buffalo. UFC 205® served as the global brand’s inaugural event in New York City and first in The Empire State since 1996. The event set numerous records, including a live gate of $17.7 million, which was a historical mark for both UFC and Madison Square Garden. UFC also set attendance records, global and domestic, with 15,480 at the weigh-in and 20,427 at the fight, respectively. 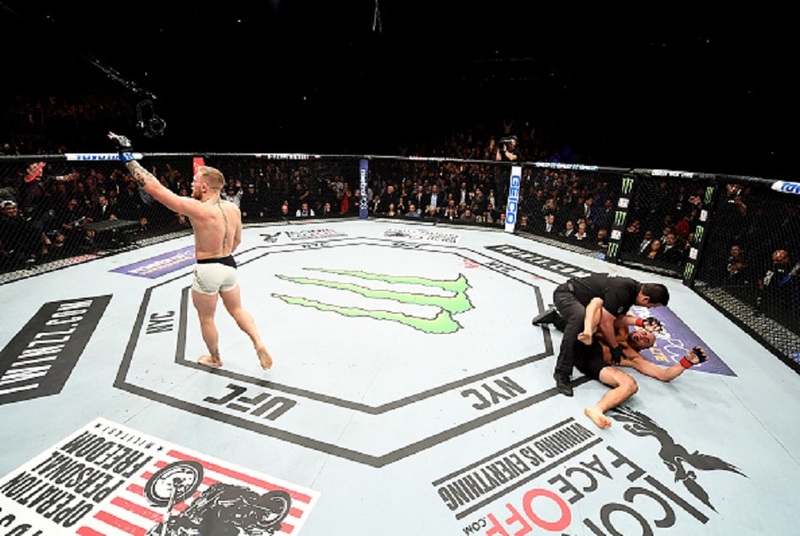 UFC 205 also established commercial Pay-Per-View (locations / gross revenue) and social media (14 billion impressions) records, while more than 1.8 million fans watched preliminary bouts on FOX Sports 1, marking the third-highest UFC prelims on the network and most viewed ever for fans M18-49 / P18-49. UFC, in partnership with Reebok, created its first-ever event-specific product line, which recorded the highest U.S. retail performance in history. The event also made history as the first PPV event transmitted live globally in 4K. While records were being set outside the Garden, history was also being made inside the Octagon as UFC featherweight champion Conor McGregor defeated Eddie Alvarez to capture the lightweight title and become the first athlete in UFC history to hold multiple championships simultaneously.